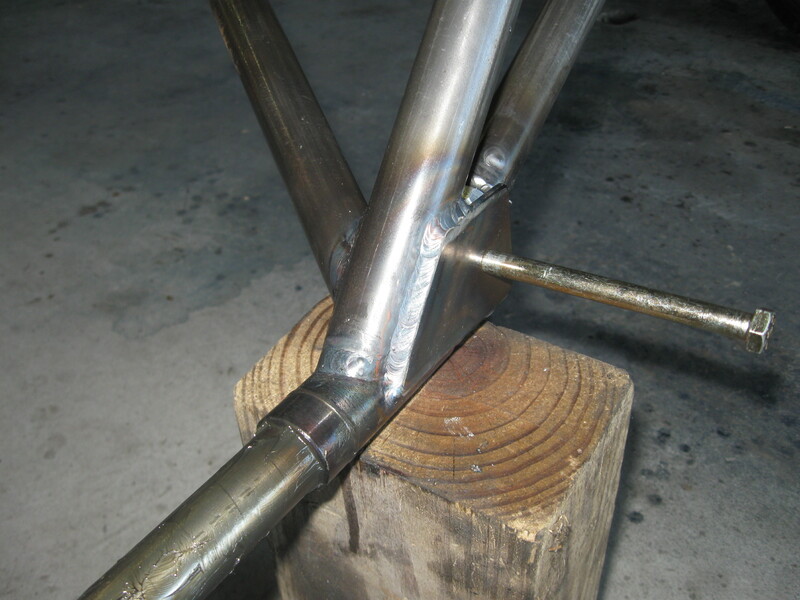 Here is a look at Terry Hand’s Steel tube Piet project. The fuselage is an original short length, taken directly from the plans in the Flying and Glider manual. We added several tubes to the right side to allow for a front door on that side. The die spring gear is the same style we have put on a number of planes. 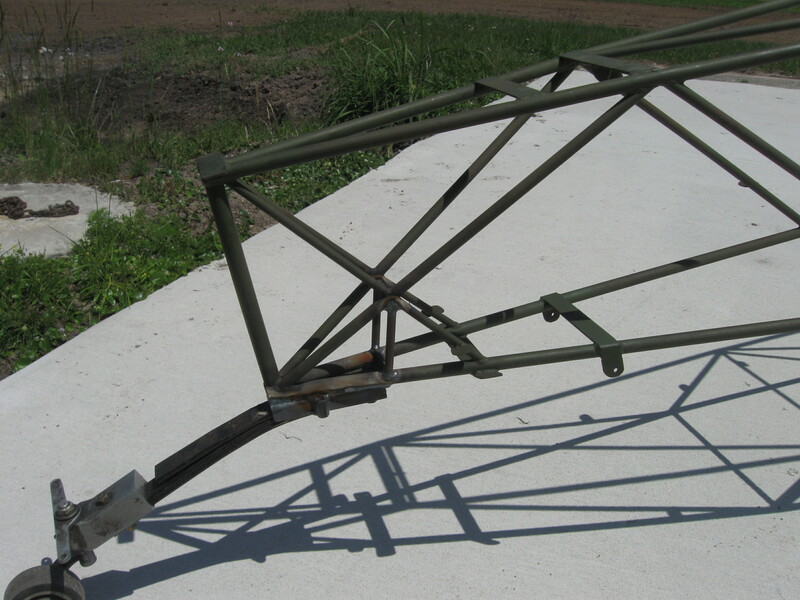 You can read more here: New die spring landing gear on a Pietenpol, 10 a.m.-4 p.m. The gear, axles, and the die spring struts weighed 27 pounds for the pair. 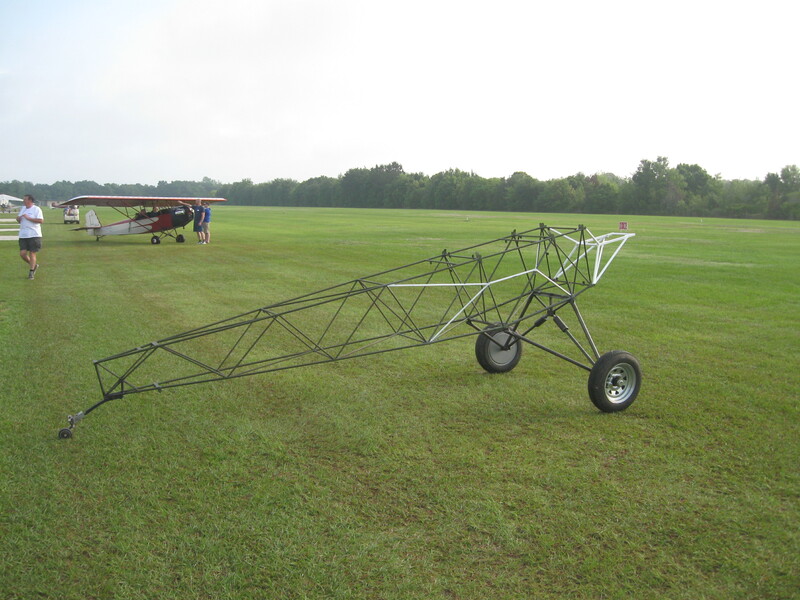 Because the gear is longer (which produces higher loads in the tubing), and we were planning on very robust construction, I opted to use the same size tubing as a late model Super Cub, and one size thicker wall. This is the same as my plane in 1999. I studied the charts on column bending limits in the back of Bruhn’s Analysis of Flight Vehicle Structures for a long time to make these choices. It is a minor weight penalty, for the gain in strength. Most Piet gear doesn’t have good enough welding on the end fittings, they are the week point, even on the standard gear. If you look at the ends we made in my shop, you will understand why I know we will get full strength potential of the increased strength tubing. The tires are 12 x 4.80″ trailer wheels. This is a project I have had in the back of my head for a long time. 13 years ago we had a Stits SA-7D Skycoupe as a test mule. It very successfully used 8 x 4.80″ tires. Look at these photos: 2,700cc-Skycoupe-2002 Photos. The 12″ wheels and tires are no where near as heavy as people suspect; the pair is 29.5 pounds. There is no question they are strong enough; the pair cost about $110; they have the same frontal area as a 6×6, but far less rolling resistance on rough ground. They will likely never wear out, but if they did, any town in America would have the replacement. Would you like to tow the plane home from the airport? There is no question on if the tires and wheel bearings are up for it. We are working on a lighter hub that incorporates a mechanical drum brake. Terry found a company that sells full moon hubcaps specifically for the 12″ trailer wheel. On the inside a 12″ pizza pan from the dollar store fit perfectly, and weighed only a few ounces. The concept is to offer an alternative to traditional spoked wheels, at a tiny fraction of the cost, with a very small weight penalty. Above, the fuselage on the ramp in front of our hangar the day before. The added side tubes for the door are painted white. To see more about the structure, you can study the shadow on the concrete. Above, another angle, showing the die spring installation. It has spherical rod ends that thread in and out for perfect camber adjustments. 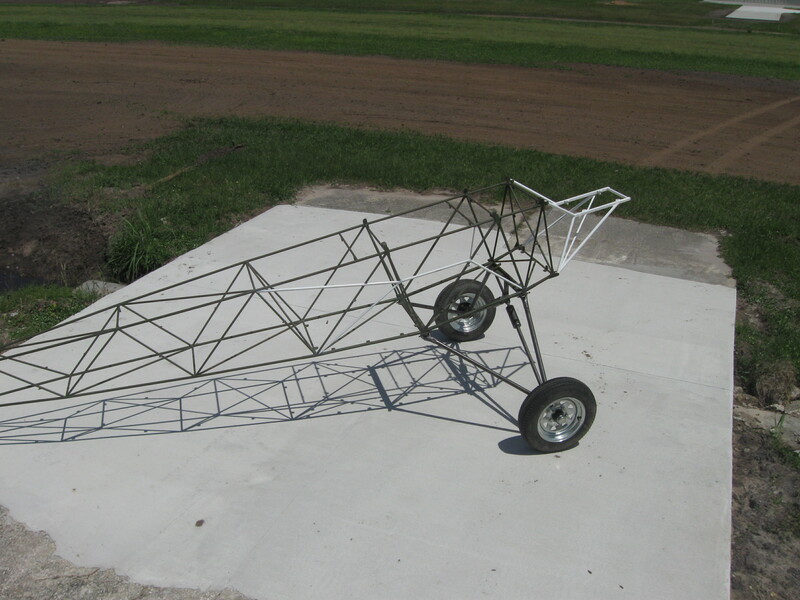 Above, we added a pad for a modern 1.25″ tail wheel spring and modern tailwheel. I found them in the sun n fun flymart for $100. This will have far greater control than older designs, and it is full swiveling. 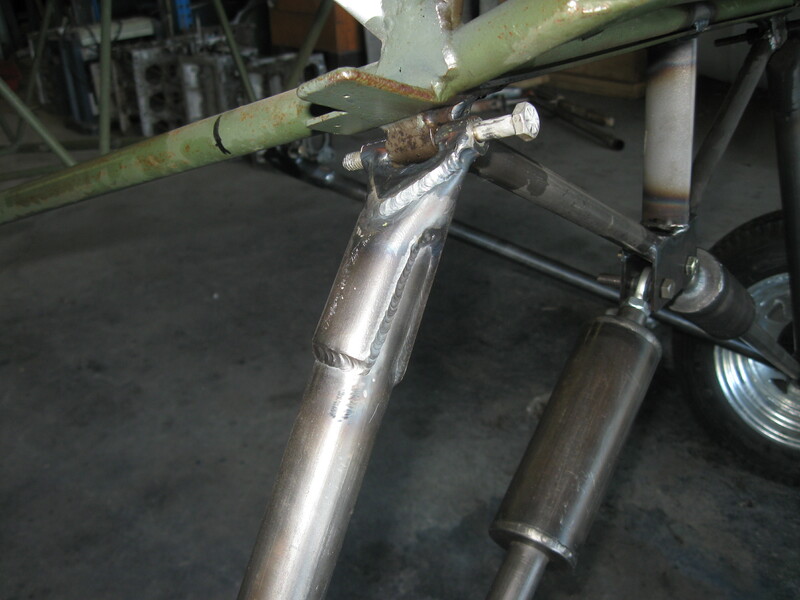 This style installation gets the tailwheel horn in a position to be connected to the rudder horn, eliminating things like spliced cables. This also has a longer wheelbase. Note the little brace tubes to pick up the loads the front of the spring would otherwise introduce into the lower longerons. Above, the die spring cans. The oldest aircraft I have seen this layout on is a Plane built by Bernard Pietenpol in the 1960s. It is vastly better than any arrangement with the springs on the outside and slots milled into the tubes. Bungee cords hate heat and oil, and are subjected to this all the time in the traditional location. conversely dies springs are impervious to heat and actually like oil. Above, get a look at how the ends of the tubing have reinforcements and sockets made for them. I carefully made these on our milling machine, and then we TiG welded them on very carefully. I am 52, and have been welding continuously since I was 17; Vern is 62 and has been welding for a living since he was16. 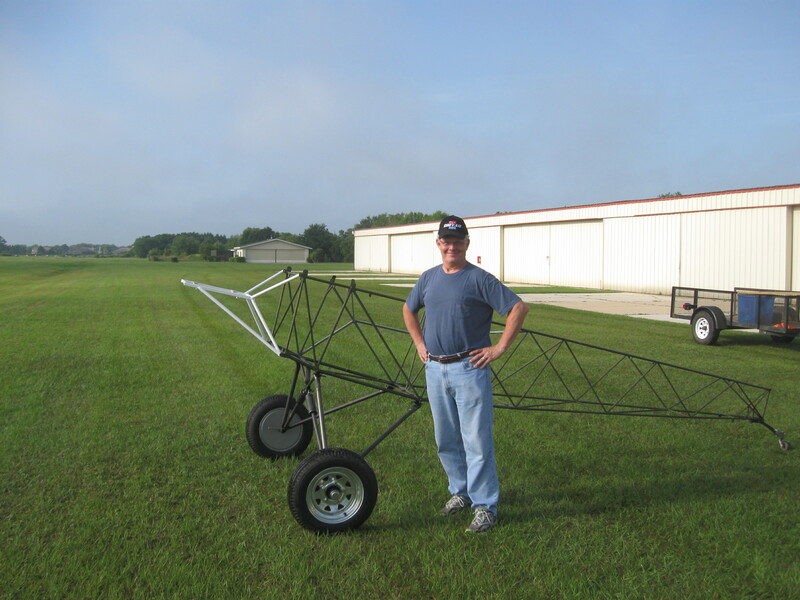 Between us, we have welded parts that have flown on several hundred planes from ultralights to F-14s. I take every opportunity I can to share what we know about welding with those who want to learn. The same week we made this gear, a person on the matronics Pietenpol internet list, with a mystery email name and no cited experience claimed that because it was Tig welded (like 99% of all aerospace structures today) it was absolutely “going to crack.” If you are a new builder, learn this: That kind of person is the enemy of your success in building and flying, and that is why we have both the Zenvair and Pietvair private groups which are free of that kind of person. 26 years in experimental aviation has taught me that I can’t win arguing with people like that, and the solution is to have colleges and groups that are free of them, just made of people who want to understand, build and fly. 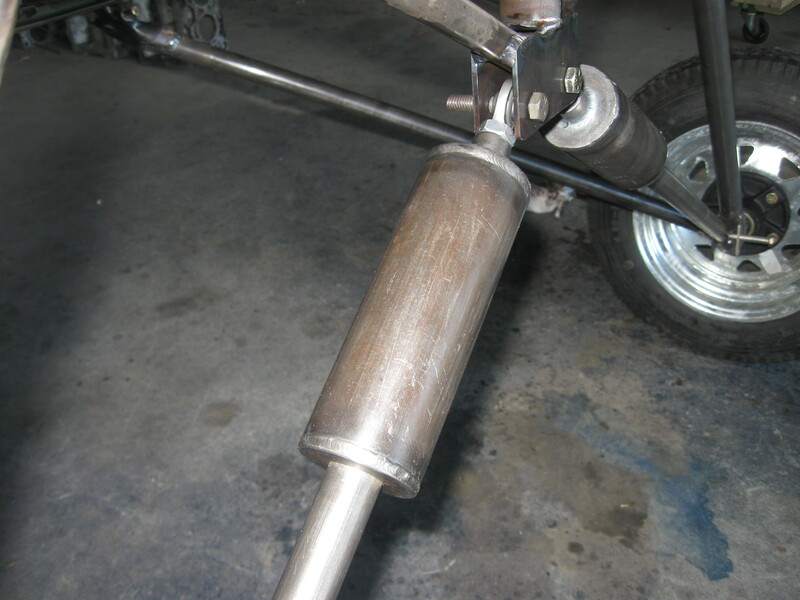 Above, the 1 and 1/16″ axle. I bored it out on the lathe to lighten it. Axle cost: $10.50. The front plate is 1/8″ 4130. The long bolt is where the mounting/ pivot bolt for the spring strut goes. If there is anyone who thinks that this weld isn’t strong, or is somehow ‘brittle’, or could have been done to a higher quality with a gas welder, they are a victim of poor information. If they convince you of this, you are allowing them to sabotage your dreams. Take your pick. Above, Terry’s project at Corvair College #33, with Bob Lester’s Pietenpol in the background. 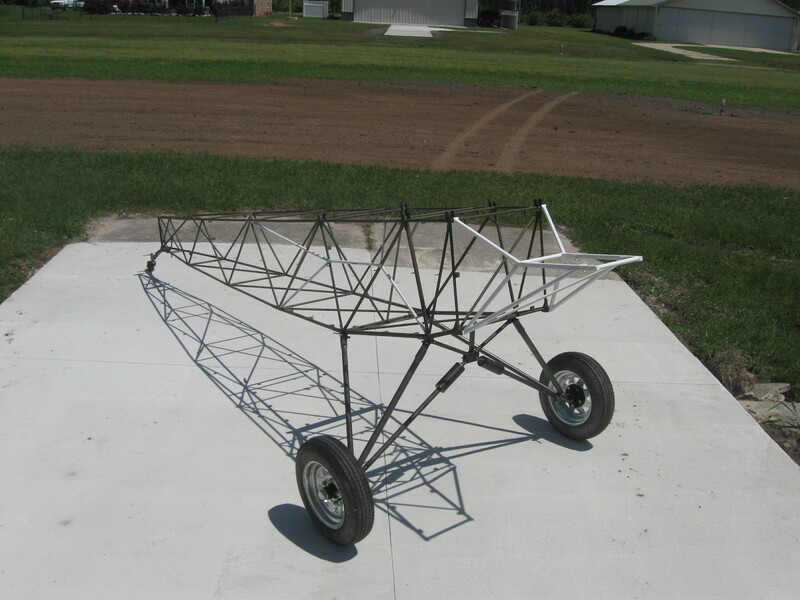 4 Responses to Steel tube Pietenpol fuselage with landing gear and 12 x 4.8″ tires. Those welds can only make you smile! Nice job! Excellent alternative to the bungees. I really like what you did on Terry’s plane too. Thanks for taking the time to share the details with everyone William. I meant too say “Bob’s plane too” I was just reading that story also. Awesome job! I am very interested in those wheels and the brakes when you figure out what works for the brakes!. I would like to put them on a experimental I am working on.